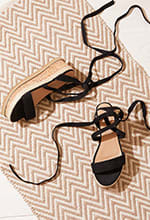 Treat your feet and slay this summer is these chic espadrilles! Featuring tie ankle detailing and woven trim, these sandals are bang on trend and are a MUST have for your new holiday wardrobe! Style with any sass beach outfit for those killer vibes!